Are you looking for a “do it all” bag? Do you like a stylish but, functional camera backpack? If so, then this HEX Grid DSLR backpack may be the one for you. The first thing I noticed about this bag was the size, it’s definitely larger than your “standard” sized backpacks, but it is one that can carry everything you need with it’s 30L of space. This is the largest version of the DSLR backpacks that HEX makes. For this review, I received the “Grid” colorway which can be described as a dark olive color. It’s a great looking color matched nicely with khaki colored straps around the outside. It is very modern looking with a squared off shape that makes playing Tetris with the inside dividers easy. The moveable dividers make lenses and gear fit safely and snug-despite it being a larger bag. At first glance, I assumed the bag was made of standard canvas, but it is made of Tarpaulin. The bag is a very water resistant specialty nylon-coated canvas with a rubbery texture. On the back side, it’s equipped with very comfortable shoulder and hip straps that hold your back against breathable airmesh. The weight of a fully packed bag is comfortable and sweat free. I have used far more expensive bags that certainly weren’t this comfortable, so you know this feature is something HEX paid special attention to. On the top side of the bag, there is an access zipper to allow you quick access to your camera or whatever item you choose to put there-more on this later. 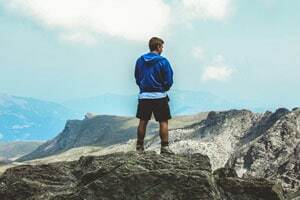 To add quality to the exterior of the bag, it has a ruggedized anti-skid bottom for setting it down on the ground and stands upright without assistance. I certainly would feel confident setting it on rock or wet ground. 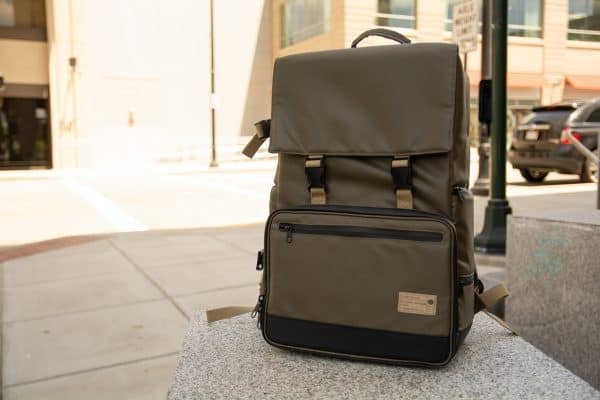 It is also equipped with a nice two-strap carrying system on the side of the bag to bring your tripod along and has a plethora of pockets to carry everything comfortably and logically. On the side opposite the tripod straps, you also have some smaller pockets for things like keys and quick access to memory cards. In regards to the interior of the bag, I can honestly say it is not hard to find a spot for just about everything you would bring along with you on a shoot. In addition to the many pockets the bag has, there are so many sections to keep your gear organized. On the front of the bag, you have a flap with two clips that open to the main compartment which has a pocket for a laptop up to 17”, space for clothing, flashes, reflectors, umbrellas etc. The lower half of the bag has a tablet pocket right on the front for easy access. The tablet pouch sits behind another pocket with multiple smaller zippered internal pockets for loose gear like SD cards, filter cases and card readers. 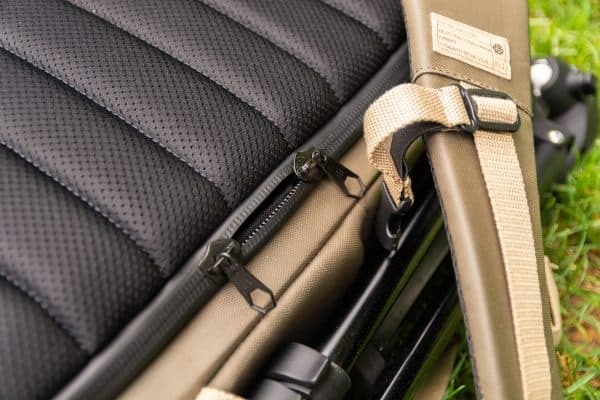 A quality feature about all of the external zippers on the unit is that they are sealed for water resistance to keep your expensive gear dry in wet weather. Despite being sealed, the zippers still are quality and zip easily without being jammed. The zippers are equipped with leather pull tabs, preventing strain on the zipper and hand. Now on to the main event, the highly customizable back half of this bag, the business end, if you will. Access to the back half of the bag is along the back-no front access! This keeps all your expensive gear safe against your body verses at the exterior. There is a very spacious and organized grid of EVA foam dividers for your camera bodies, lenses, flashes, and anything else you can fit in this large section. All the foam separators can be ripped out and reorganized to fit your needs due to the velcro. As mentioned before, a zippered access pocket on the top of the bag which allows for easy access to your camera. While you can fit a pro body camera in this bag such as a D5 or 1Dx, (I test fitted my D4) this top pocket isn’t quite meant for a big camera. However, you can easily get a mid-side full frame like a D850 or 5D Mk IV to fit well. To give you an idea of the size in this section of the bag, I had a bit of trouble finding things to fill it with. I put a D7100 with a grip, a 24-70, a 70-200, a speedlight, 50mm, some filters and there was still space for another body and another lens or two. It is incredible the amount of space this bag has. 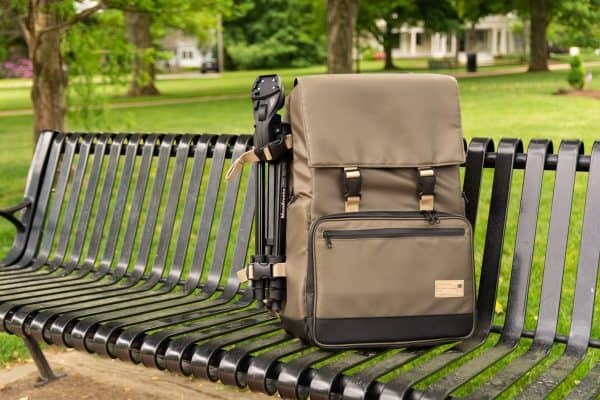 This bag would work great for both a full time photographer who travels from shoot to shoot, a weekend warrior, or a busy wedding photographer-it just has that much space. In conclusion, I think this bag is a great solution for someone who wants both a stylish and functional bag. The bag doesn’t necessarily look like a photography bag at first glance-something I found very appealing. The bag makes for a great travel companion, is very well organized, weather resistant, comfortable, versatile, and extremely spacious. The rugged zippers and fabric make the bag very durable for outdoor and long term use. I would feel confident taking this bag on a hike knowing all my gear was safe and the bag’s durability would withstand unfortunate weather. 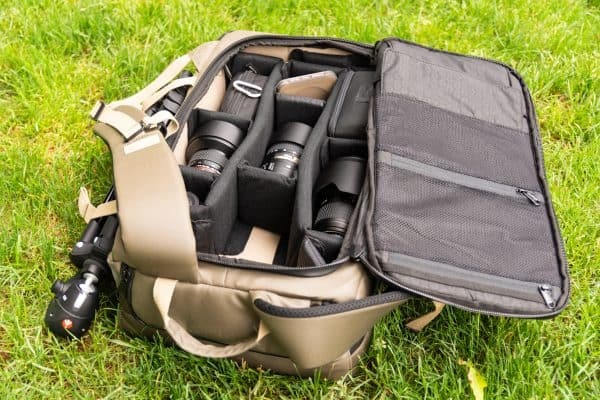 This bag can fit multiple camera bodies with a variety of lenses and equipment. Overall, the bag is certainly worth the investment.